The many chedis of Wat Po. Thai temples seem to some in an infinite number of shapes and sizes, so it may be surprising to learn that they all have the same set of elements. Every temple must have a bot, surrounded by eight Sema boundary stones, and will often have one or more wiharn housing an important Buddha image. Note that in rural Thailand, as well as Bangkok itself, temples often house schools, serve as meeting places for the community and even places where the departed are cremated. Thai temples are places of worship. When visiting temples, you should abide by the acepted etiquette for visitors. Thais are very forgiving by nature, but its best not to give offence in the first place. A temple, which may include not only congregation halls, but also a monastery, school rooms and sports grounds. Note that in Thai, the term wat may be applied to any religious center, so Christian churches and Muslim mosques may also be referred to as wats. 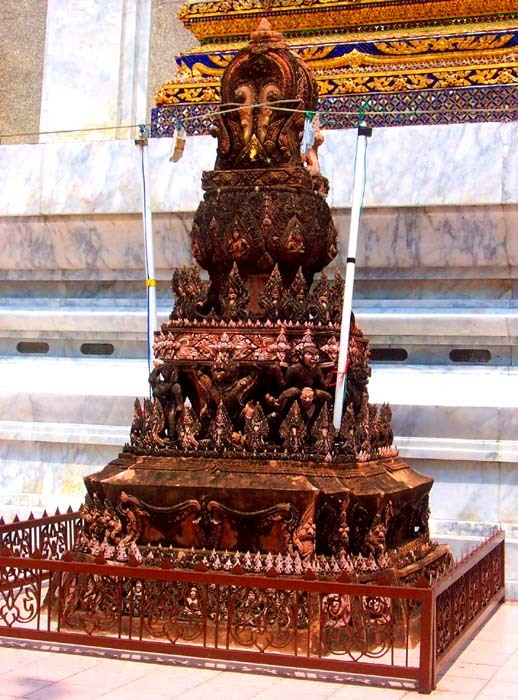 The ubosot of Wat Phra Singh in Chiang Rai. The ordination hall, where new monks are ordained and other important ceremonies take place. The ubosot is not necessarily the largest building in a temple compound, and may not always be open to the public. In fact, the ubosot is supposed to be off limits at all times to women, but this rule is seldom enforced. The ubosot will always have an alter with at least one Buddha image, making it hard to tell the difference between a Bot and a Wiharn. The easiest way to tell the difference is that only the ubosot will be surrounded by Sema stones. Bot can also refer to a Christian church building. Wihara - which can also be spelled with a "V" instead of a "W" - house important buddha images and are where the laity come to pray. While there will always only be one ubosot in a wat, there can be several Wiharn. The elaborate sema stones next to the ubosot of Wat Indrawiharn in Bangkok. Boundary markers, always made of stone. The ubosot is always surrounded by eight boundary stones, marking the sacred ground of the temple. The word bai means "leaf" in Thai. The stones are usually leaf-shaped. Chofah are the decorations at the end of roof gables. In Bangkok and the central plains, they are generally shaped like an abstracted antelope head, although they can also be very bird-like. Sometimes translated as stupa or even pagoda. This generally bell-shaped tower will usually contain a relic of the Buddha, but may also be built to contain the ashes of a king or important monk. Those who can afford it may also build smaller, typically square-shaped, ones for their own final resting place. The bell-shaped chedi evolved during the golden age of Ayutthaya, so naturally one of the best examples is found in the aptly named Wat Yai Chai Mongkon. A more phallic-shaped tower that will be in the center of Ayutthaya and khmer-style temples. The prang is typically described as a "corn-cob" shape. Prangs can be found all over Ayutthaya. Perhaps the best example is Wat Chai Wattanaram. Generally, any open-sided pavilion. In a temple, these may be used for sermons. Some Wiharns are built in this style. The most notable one is at Wat Suan Dok in Chiang Mai. Both of these terms could be translated as "library." A Ho Trai was often built on stilts over a pond to keep out the vermin. A Mondop is almost always square in shape, and may house scriptures or special images. Perhaps the most spectacular Mondop in Thailand is found over the Buddha's Footprint in Saraburi Province. Some temples will also have a drum or bell tower to call the faithful. Drums were more common than bells. A temple that also acts as a monastery will have monks' cells, called "kuti." These can come in all shapes and sizes. The Naga is a mythical serpent that, according to legend, sheltered the Buddha while he was meditating. The "accepted" version of the story is that it was a cobra, and is often represented in Buddha images. In temple architecture, the Naga will often be used as a decorative motif for stair railings and roof edges. Nagas should not be confused with dragons, which are often featured in Chinese style architecture.